"You go looking for trouble and by God you find it." Growing up in Canada, a staple of our culture is the National Film Board's presence in the creation of Canadian film presentations, which often portrayed lifestyles unfamiliar to me, though painting somewhat romantic images against a backdrop of the harsh reality of life in some remote regions of this country. Produced with help from the NFB and twice voted the best Canadian film, director/actor/writer Claude Jutra's masterwork, Mon Oncle Antoine, tells the coming of age story of a young boy in a small Quebec mining town during the 1940s. Written by Jutra and Clément Perron (whose 1973 film Taureau I'd like to see on DVD sooner than later) and shot on location in Quebec at the Thetford Mines, as well as Black Lake City, the film chronicles the events of one pivotal Christmas season in this small community. Jos Poulon (Lionel Villeneuve), father of five, is fed up with his job at the asbestos mine, and decides to abandon his family to go work in the lumber camp for the winter, leaving his wife (Hélène Loiselle) and eldest son to run their small farm and attend to the children. Young Benoit (Jacques Gagnon) lives several miles away in town with his aunt Cecile (Olivette Thibault) and uncle Antoine (Jean Duceppe) at the general store, which is the center of their community. He helps out at the church, assisting his uncle, who is also the town undertaker. While Antoine should be the pillar of the community, he instead spends most of his day drinking in the back room, while his nephew Fernand (Jutra) attends to the books and runs the store, with the assistance of Benoit and a young girl, Carmen (Lyne Champagne), who shares both the attentions of Benoit and the unwelcomed leers of Fernand. As Christmas moves ever nearer, the yearly window display at the store becomes the center of attention, though wedding plans and the arrival of a new corset for the town debutante (Monique Mercure) also draw interest, especially from the young boys wishing to sneak a peak at Alexandrine as she tries on her latest acquisition. When the eldest Poulon son falls terminally ill and Benoit's uncle is called upon to go out to their farm, the events that follow will be a revelation as Benoit learns to look at life in a new way, and begins to understand the personalities and relationships of his elders, and his own growing responsibilities in the community. It is nice to see more films from my homeland making their way to DVD, though the absence of titles like Why Shoot The Teacher (1977) and The Little Girl Who Lives Down The Lane leave me wanting more. A charming drama, balancing seriousness with a comedic edge, portrayed in a very natural, and very Canadian style. Mon Oncle Antoine counters the foibles of small town life with its realities, in a sensitive and touching film. Image Transfer Review: Mon Oncle Antoine is presented in its 1.33:1 aspect ratio. Aside from a few print defects the source looks pretty good. Grain level is variable but is generally well rendered. There is some edge enhancement present, colors look good though not overly saturated. Contrast seems a bit strong in places, though that could be attributable to the source. There is some faint rainbowing in scenes with high contrast and fine detail, such as woodland shots against snow. Audio Transfer Review: Audio is presented in both original French and an English dub. The French track is generally clear with only location noise present. A small amount of distortion is audible in some dialogue scenes, though this sounds source-related. There are also a few brief dropouts. Overall an acceptable soundtrack, though nothing outstanding. Extras Review: Like the winter Quebec wilderness, this disc is barren of any extra features. A sparse 12 chapter stops cover the film. I was a little taken aback by the Janus logo on the cover which could often lead to gems from the Criterion Collection, though this title seems to have been given adequate, if not overwhelming, representation on DVD. 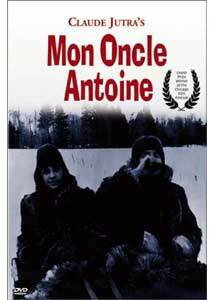 Though many may find the pacing of the film to be a little on the slow side, for those who would like to visit the lost days of yesteryear in a quiet Quebec village, Mon Oncle Antoine is a prize worthy of uncovering. The cast turn in superb, if understated performances, and Jutra perfectly captures the essence of a bygone era, and the realizations that come with maturity. A touching piece of Canadiana that I hope we see more of. Recommended, eh.